The Maritimo A50 Agean Enclosed is an impressive boat in its own right, but the really special feature of the review boat was its manoeuvring system: the new Twin Disc Express Joystick System (JTS). One of the biggest deterrents to owning a 50-footer – after finding the money and a pen – is the worry about parking it. The JTS reduces the skill level required to less than that needed to put a car in a kerbside parking slot. 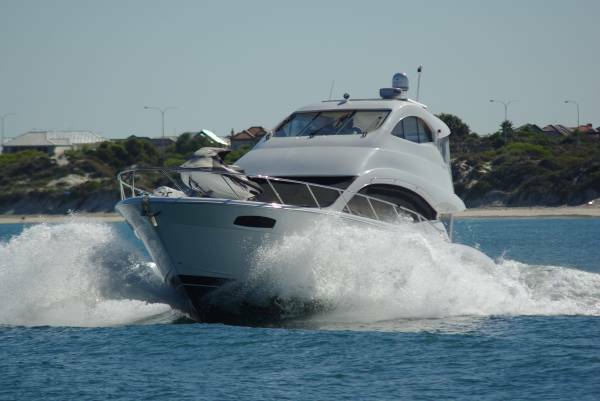 The boat itself is a typical Maritimo product – all the style of the Europeans, but with the practical features Australians have shown a preference for. The most important of these are shaded outdoor space, and easy access to all parts of the vessel. 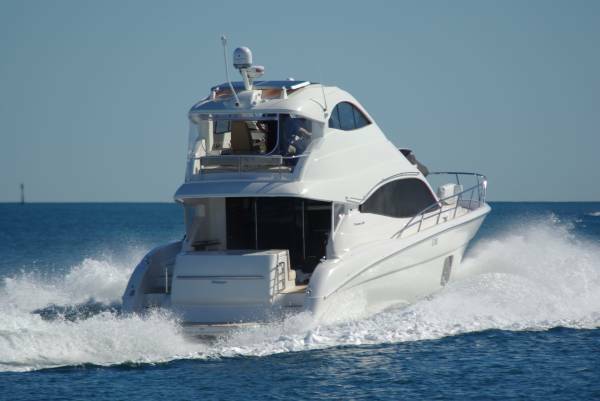 Maritimo took enough of the beam away from the accommodation to provide easy passage along the side decks, and then provided well-proportioned steps and grab rails as well as guard rails. 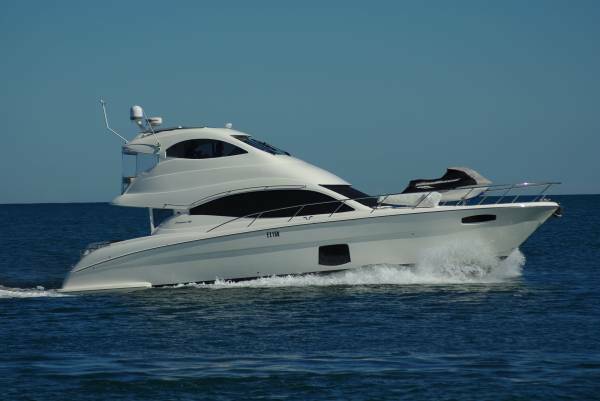 These provide easy access to the foredeck where, according to taste, you can stretch out on a sun bed or do as this boat’s owner has and install a jet ski and knuckle boom crane. The accommodation has a three-cabin layout of two doubles plus a single instead of the more common twin; omitting a single berth made all three cabins spacious - no one travels second class here. The standard of fit-out is, not surprisingly, also first class, in a balanced mix of timber and synthetics. The beds are sumptuously comfortable, vast amounts of storage are offered, and the bathrooms – an en suite plus a shared bathroom – are sybaritically spacious and appointed. A good feature below is the natural lighting from the side as well as through skylights. The master and the single each have a particularly large window, set low enough to provide a view from in bed. The saloon too is well lit and well laid out. Particularly practical is the siting of the galley immediately inside the wide-opening rear doors, convenient to the inside dining space that seats eight around a convertible table, and to the alternative dining space in the cockpit. 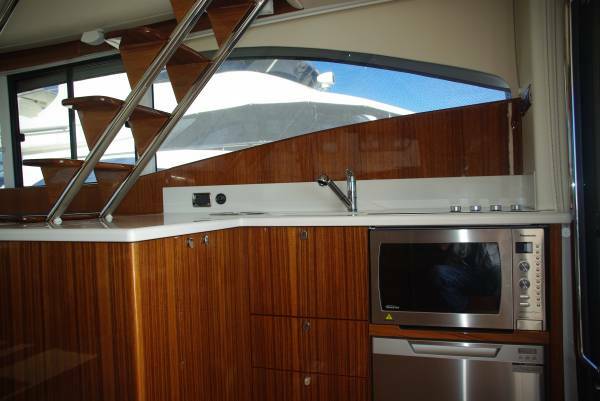 Although inevitably the cockpit barbecue will get more use, the galley has the gear to tempt a cook into tricky dishes. A four-burner stove plus microwave, specialised stowage for equipment, room to spread out, and a dishwasher to deal with the boring bit. There is also no shortage of places to store food and drinks. Besides the domestic fridge-freezer adjacent to the galley, there are two more fridges in the cockpit plus a fridge-freezer-icebox, and for good measure another fridge on the bridge. As well as being air-conditioned like the other interior spaces, the saloon can develop a through breeze via the rear doors and opening side glass. 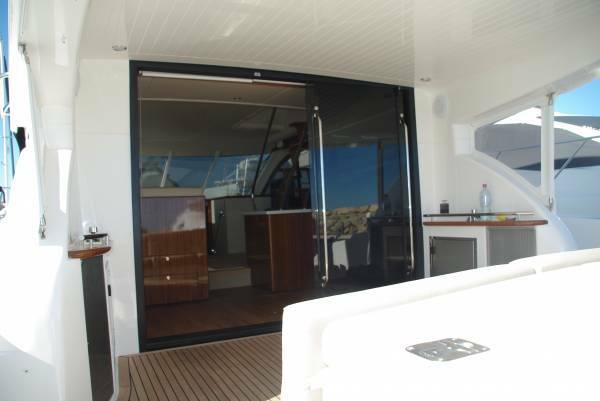 Occupants have the use of one of the three jumbo TVs on board, and easy access to the virtual other saloon on the bridge via an open internal stairway and a clear safety door. Opening the windows, sliding the roof and removing the rear clears make the bridge a near open space. Putting them all in place makes a spacious air-conditioned room. 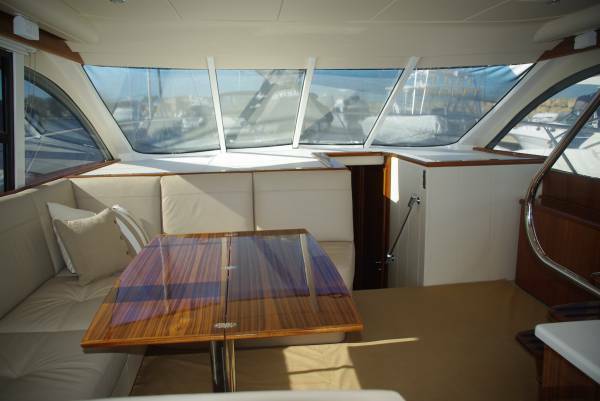 In room mode it offers a table, settees for six, and a wet bar, and would easily convert to a temporary fourth cabin. In driving mode it has excellent vision from two gorgeous chairs at the dash, triple windscreen wipers, spectacular electronics, and the magic of the JTS. The heart of the system is the Quick Shift electronics of the gearboxes, which, in this boat are fed by a pair of C12 Caterpillars. They are linked through more electronics to a bow thruster and, in this case, a stern thruster, both hydraulically powered – electric thrusters could not handle the sustained running. The thrusters and main engines can be used conventionally with individual controls, or at low speed and when manoeuvring with a single joystick. This makes everyone an expert driver after a quick familiarisation. 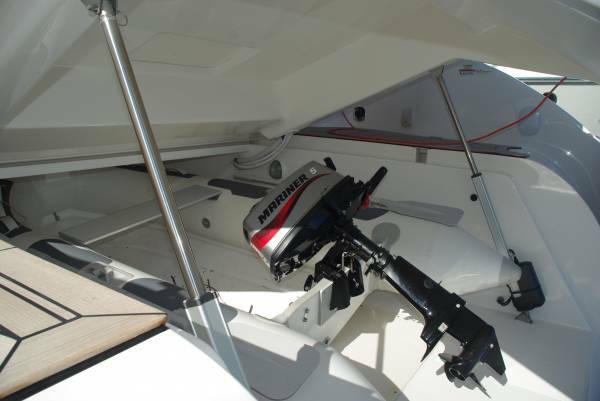 The joystick takes the boat forwards or backwards, crabs it, or drives it diagonally. 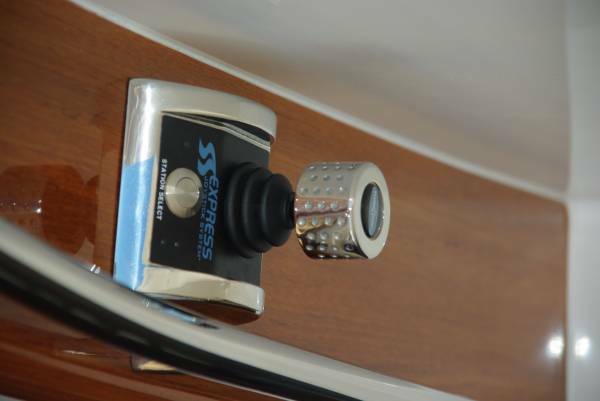 The buyer of the review boat also specified extra controls port and starboard in the cockpit to put him close to the mooring lines when penning or coming alongside. Once on the mooring or at anchor the cockpit is where the action is. Between cockpit and platform is an island hiding more space than Tardis. Lifting the lid reveals the barbecue in conventional style for on-board entertaining. For shore excursions the touch of a button lifts the whole island to expose the garage containing a useful-sized inflatable tender.